The GFWC Northboro Junior Woman’s Club (Massachusetts) used toolkits provided by UNICEF to host an Ethically Made Luncheon in December! 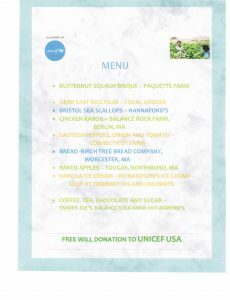 They also showed UNICEF’s film about human trafficking, “Not My Life.” The menu was placed on every table to show where the club locally purchased the food items served, like baked apples and sea scallops! Attendees were not charged for the luncheon, but instead were asked to donate to UNICEF if they were moved to do so. They were pleased to send a check of $533 to further UNICEF’s mission of stopping human trafficking. The Woman’s Club of Parsippany Troy Hills (New Jersey) recently held its Fourth Annual Spelling Bee. Twenty-five students were selected from local fifth grade classes to participate, with over 100 audience members. Mary Ann Coyne, club member and chairman of the event, was moderator. Club member Marianne Burke was the pronuoncer. After twenty-five exciting rounds, the top three winners were declared. They are invited to participate in the New Jersey State Federated Women’s Club Regional Spelling Bee on February 2, and regional winners will then be invited to the State Championship at the New Jersey State Federation of Women’s Clubs of GFWC Headquarters on March 2nd. These events give students a chance to shine and show off their spelling skills! 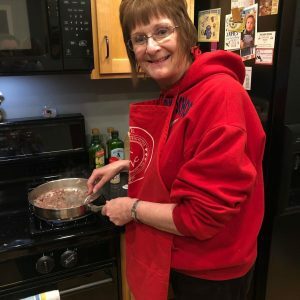 The Elgin Junior Women’s Club (Illinois) recognize that homelessness is a significant issue in their community, with many working poor and a housing shortage. They had the organization, PADS of Elgin, come to their November General meeting to present for Home Life. During their presentation, they mentioned one of their biggest needs is for meals to be donated. They serve dinner, and now lunch, to 60+ shelter residents every day. But they don’t have the staff or funds to have a full service kitchen, so they coordinate with other organizations. 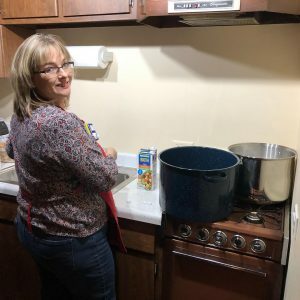 When the Elgin Juniors were trying to think of a service project for MLK Day, they though prepping a meal for the organization would be a great opportunity. 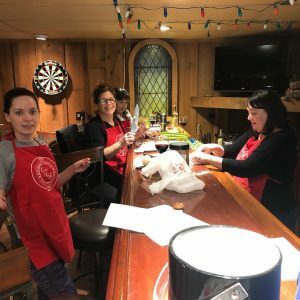 The club created the event with a signup for people to provide ingredients. The event was made public in case others were interested in serving. The response was overwhelming. The signup sheet to make two meals for 60 people was completely full in 24 hours! More non-club members than club members took slots for donations, and many others asked if they could still come and help even when the slots were full. The club ended up having 13 people come to a clubwoman’s house to make meals. They made 6 lasagnas and 5 trays of chicken and rice soup in 90 minutes. The women who were guests were all interested in serving again, and expressed interest in future club meetings and events. There were also almost a half dozen other women who were unable to make the event, but expressed interest in both club and another project like this one. In one small event, they were able to provide two meals for 60+ homeless people in their community, provide aid to a great organization, and get about a dozen new potential members for club! In a club of 13 women, it was a huge success. It was also very easy to replicate, so they plan on doing it again!